Greystone, a property development company, bought the Brooklyn Lyceum for $7.6 million at a foreclosure auction on Oct. 23, a spokeswoman said. PARK SLOPE — A real estate developer bought the Brooklyn Lyceum performance venue at a public foreclosure auction Thursday, a spokeswoman for the buyer confirmed. Greystone, a financial services and property development company, bought the 1908 building on Fourth Avenue and President Street for $7.6 million. The spokeswoman declined to comment on Greystone's plans for the landmarked Lyceum until after the sale closes in roughly 60 days. Greystone developed Williamsburg's Printhouse Lofts and recently bought two Clinton Hill properties that will be turned into "luxury apartment rental buildings with high-end amenities," according to the company's website. 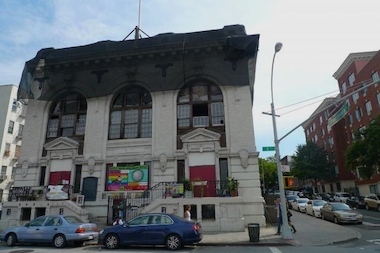 The foreclosure auction, first reported by Here's Park Slope, is the latest in a series of blows for the Lyceum, a former public bathhouse that now hosts arts and cultural events ranging from theater to craft fairs to wrestling shows. Owner Eric Richmond, who bought the Lyceum in 1994 when it was a derelict eyesore, has been entangled in a decade-long legal dispute and the building has more than $5 million in liens. Richmond said Thursday that he and some new partners had hoped to buy the property at the auction, but they were outbid. “We have much appreciated the hundreds of people who have expressed support of our cause,” Richmond said in an email. Richmond said he's not giving up on two legal fights that could change his plight, including a dispute over whether a judge was allowed to rule on his case. Richmond is still hoping to hold on to the building if he prevails in court, he said. In the meantime, he warned that he may have to cancel upcoming events such as an annual live stage version of "A Charlie Brown Christmas" and holiday craft market. Richmond recently launched an online petition to try to sway a bankruptcy judge in his favor. More than 200 people have signed the petition. "The Brooklyn Lyceum is...a social and community hub on Fourth Avenue," wrote one supporter. "From dance parties to high holiday services, the Lyceum is a place for people to come together under a common cause. Please don't let it be taken away."